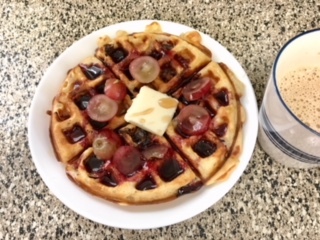 There’s something totally satisfying about making homemade waffles. A delicious combo of warm and fluffy and golden and crunchy, waffles are our favorite way to wake up in the morning. 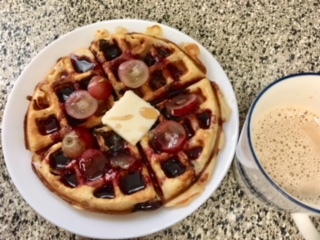 With just a few pantry staples and a waffle iron, you’ll be able to perfect this waffle recipe in no time. If my mind is not playing trick I guess I brought a waffle maker at Home Depot few months back and it’s tugged somewhere in my kitchen cabinet. It's time to put that waffle iron languishing in the back of your cabinet to good use. These airy, delicate and crisp-edged waffles are so fabulous, yet so simple to throw together, they're destined to become part of your weekend breakfast routine. 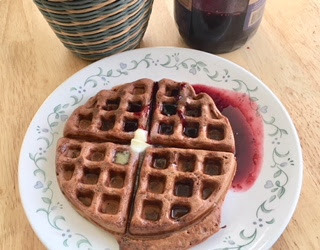 These Eggless Waffles are easy to make, with simple ingredients you likely have on hand! They taste like the real thing! These waffles are super crisp on the outside, light as a feather inside and so scrumptious! Avoid removing them from the waffle iron too soon; they should be a golden brown. To paired up this home made easy mixed berry sauce is made with fresh or frozen berries, sugar, vanilla, and corn starch. Thick, sweet, and perfect for topping waffles or pancakes. 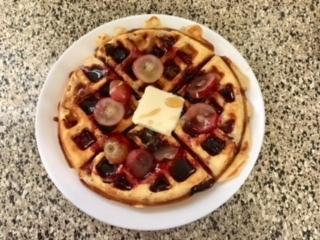 Enjoy the perfectly made plate of waffles drizzled with berry sauce to your dinning table. Combine the flour, baking powder ,salt and sugar. In a separate bowl mix together the milk, oil, water, vanilla and butter. Add the wet ingredients to the dry ingredients, and mix together gently. As with all pancake batters, it should be slightly lumpy. Let the batter sit for a few minutes to give it time to puff up. Once your waffle maker is ready to go, depending on the size of your maker, scoop the batter in and enjoy! Place 1 1/2 cups berries in a small saucepan. Cover with water and add sugar and vanilla. Heat over medium-high heat until mixture comes to a low boil and berries just start to break apart. Add dissolved cornstarch to saucepan and bring mixture to a rolling boil. Turn heat down and simmer on low heat for 2-3 minutes, or until sauce reaches desired consistency. 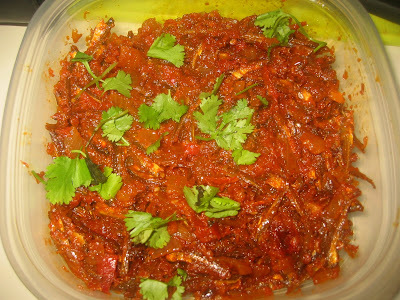 Add water, one tablespoon at a time, if the sauce gets too thick. Remove from heat. Add remaining berries and stir gently. Serve warm or cold. Combine the flour, baking powder , coco powder , cinnamon powder , salt and sugar. In a separate bowl mix together the milk, oil, water, vanilla and butter. Add the wet ingredients to the dry ingredients, and mix together gently. Finally mix in the crushed walnuts and blend well. As with all pancake batters, it should be slightly lumpy. Let the batter sit for a few minutes to give it time to puff up. Once your waffle maker is ready to go, depending on the size of your maker, scoop the batter in and enjoy! Note: Addition of 2 egg whites yields more fluffy waffles.